Who's affraid of goats, sheeps, horses and cows? Most Humans are not, since these animals are rather pacific and useful to us. But herbaceous plants and shrubs have plenty of reasons to hold great resentment toward these species, who consistently eat them. So what is a plant to do when lunchtime rings? Poisoning is in fact a great way to go! Plants that are toxic to herbivories are plenty. Today, I'll review three examples of sophisticated chemical defenses produced by plants to deter hungry stomachs. Sheep laurel (Kalmia angustifolia), also known as lambkill, certainly has a charming name. Sheeps are particularly vulnerable to the grayanotoxins biosynthetized by sheep laurel . 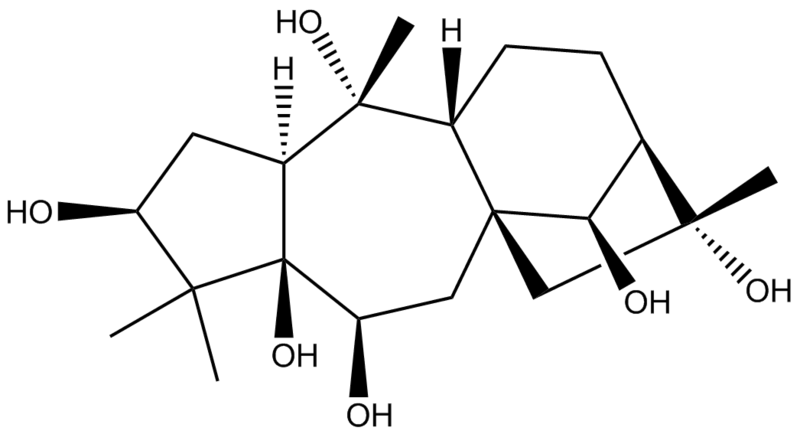 These molecules, belonging to the diterpenoid family, disrupt the normal functions of smooth muscles. The latter are responsible for the proper operation of the digestive tube, and as such grayanotoxins cause severe gastrointestinal troubles, accompanied by coordination disabilities and severe pain, and can be lethal . Since sheep laurel retains its leaves throughout winter, even in the coldest aeras, it is an extremely efficient protection against herbivories in those months were food is rare, and when the kalmia becomes a tempting snack despite a rather unpleasant texture . compounds found in Kalmia angustifolia. Grayanotoxins and their sophisticated chemical structures are also found in other plants of the Ericaceae family, including rhododendrons . They in fact were likely the first chemical weapons used by mankind - an unusual purpose for natural products. Since grayanotoxins are present in the pollen of rhododendron, honey can become contaminated by the toxins, inducing what is known as "mad honey disease". Knowing that, the Ancient Greeks of the Pontus region, near the Black Sea, in their fight against Pompey in 67 BC, made sure that fouled honey was made available to their ennemies. The Romans ate the honey, and experimented nausea, vomiting and paralysis, which of course gave plenty of time for the Greeks to wipe them out . Poisoning is not the only way to go, though. Taste itself can be an effective deterrent for herbivories. Plants from the Salicaceae family, including the balsam poplar (Populus balsamifera) are well known for their production of polyphenolic glycosides compounds related to salicylic and gentistic acids . If you ever chewed on an aspirin pill, you know from experience how bitter this class of molecule is. 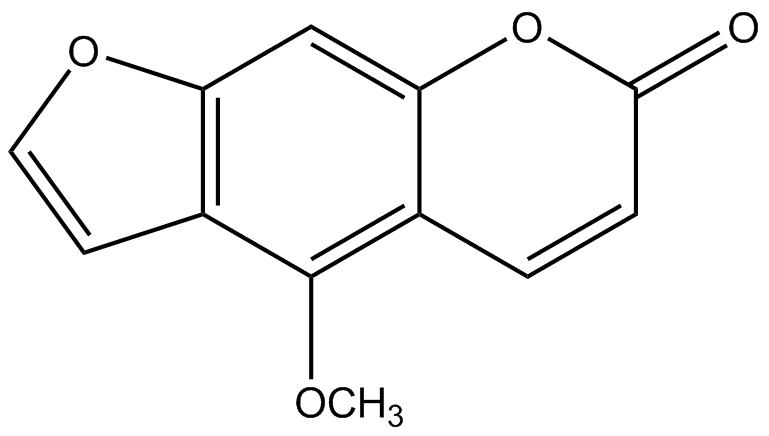 Salicylates and gentisates come along with a few specific volatile constituents which I have briefly talked about in my post about the volatile constituents of quaking aspen (Populus tremuloides) . Together, these compounds are thought to create a unpleasant taste for poplar twigs, which appears to be an efficient protection against hares and other herbivories [4, 6]. Chemistry does not come for free - plants have to spend energy and carbon to biosynthetize defense molecules. As such, poplars show some seasonal variation in their phenolic constituents. In fact, the first sharp frost of the winter triggers heavy salicylates biosynthesis in the twigs, especially young  and thus more useful ones. Winter is a particularly sensitive period, because herbivories are more eagerly looking for food. The polyphenols are thus prepared especially for this time of the year, and their concentration slowly decreases back to low levels as spring comes around . That is an impressive timing. Sometimes, we are the herbivories... And it may be more complicated to get rid of us! Many plants of the Apiaceae family, such as carrot and celery, have a dietary use for mankind, but the family also counts several toxic members. One of the hallmarks of several of the Apiaceae are furanocoumarins. These molecules, when present in large quantities, can penetrate the skin, where they interact with light to induce severe burns . Cow parsnip (Heracleum maximum) is also called Indian celery, because several members of the First Nations in North America ate the stalks as a vegetable . Yet, the plant is not devoid of furanocoumarins: they have been often reported in this species [7, 8]. This could have been an efficient protection, if only the wise First Nations did not peel off the first layer of the stalks before eating them. Since furocoumarins often cover the outer membrane of the plant, this proved to be an efficient way to avoid discomfortable "itches in the mouth" and burns around the lips . Li, Y.; Liu, Y.; Yu, S. Grayanoids from the Ericaceae family: Structures, biological activites and mechanism of action, Phytochem. Rev., 2013, 12, 305-325. Boeckler, G. A.; Gershenzon, J.; Unsicker, S. B. Phenolic glycosides of the Salicaceae and their role as anti-herbivore defenses, Phytochemistry, 2011, 72, 1497-1509. Reichardt, P. B.; Bryant, J. P.; Mattes, B. R.; Clausen, T. P.; Chapin III, F. S.; Meyer, M. Winter chemical defense of alaskan balsam poplar against snowshow hares, J. Chem. Ecol., 1990, 16(6), 1941-1959. Clausen, T. P.; Chen, J.; Bryant, J. P.; Provenza, F. D.; Villalba, J. Dynamics of the volatile defense of winter "dormant" balsam poplar (Populus balsamifera), J. Chem. Ecol., 2010, 36, 461-466. Camm, E. L.; Wat, C.-K.; Towers, G. H. N. Assessment of the roles of furanocoumarins in Heracleum lanatum, Can. J. Bot., 1976, 54, 2562-2566. Webster, D.; Taschereau, P.; Belland, R. J.; Sand, C; Rennie, R. P. Antifungal activity of medicinal plant extracts: preliminary screening studies, J. Ethnopharmacol., 2008, 115, 140-146. Kuhnlein, H.; Turner, N. Cow-parsnip (Heracleum lanatum Michx. ): An indigenous vegetable of native people of northwestern North America, J. Ethnobiol., 1987, 6(2), 309-324.